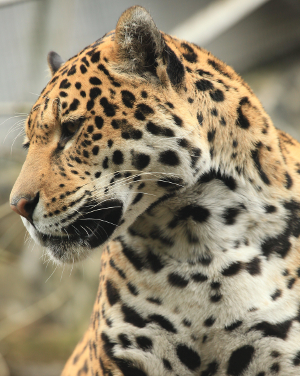 This beautiful jaguar is one of many heart-warming photos taken by Scott Liddell. It is saved here with width and height pixel dimensions to fit the space on this web page. But what size can I print my original copy of the photograph and retain its quality? When you are printing a picture, the important thing to consider is image resolution. 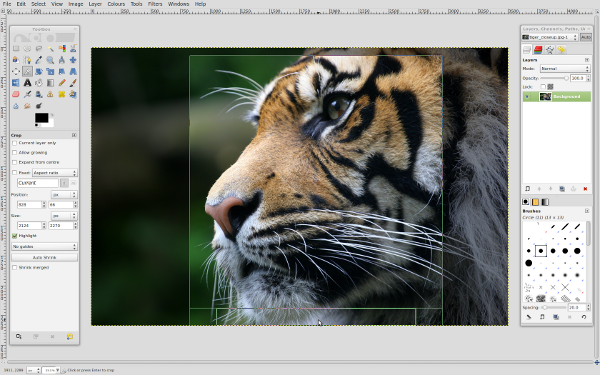 Image resolution consists of two elements: the number of pixels in a square inch and the size of those pixels. You only need to think about the number of pixels per inch. (Your computer will take care of calculating the size of the pixels.) Image resolution is measured in ppi (pixels per inch). Printed photo sizes are traditionally measured in inches (e.g. 8 x 10 inches, 4 x 6 inches). You may find it more relevant to measure your printed image in millimetres (mm) or centimetres (cm). It does not matter which unit you use to measure your picture’s width and height. Just choose the one that is right for you. Whichever measurement unit you work in, you will still use ppi (pixels per inch) for the image resolution. 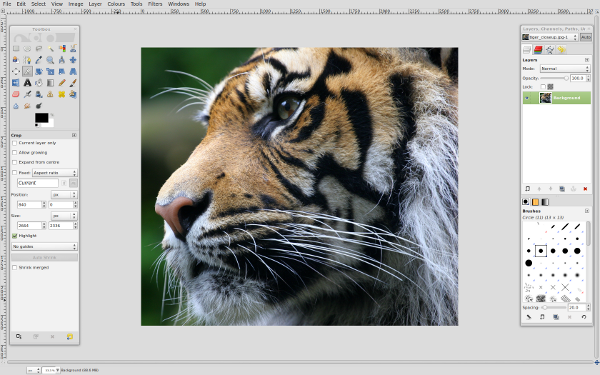 You can use GIMP to see what size you can print a picture without spoiling its sharpness and quality. Good practice note: always copy your image first and work on the copy. A box with the title “Set Image Print Resolution” will open. It has “Width and Height” options and “X resolution and Y resolution” options. Make sure the lock symbol next to the X and Y resolutions is closed or locked. You can click on the lock symbol to toggle between locked and unlocked. Keeping the lock closed will ensure the X and Y resolutions are the same. Make sure the measurement next to the X and Y resolutions is pixels/in. The X resolution is the number of pixels per inch (ppi) going horizontally. The Y resolution is the number of pixels per inch (ppi) going vertically. In some image software these values are set with a single number. In GIMP you just need to make sure you have the same number for both resolutions. Keeping the lock symbol next to the X and Y resolutions closed, will keep your image in proportion. The print quality you can get from any image depends on a number of factors. These include the type of printer, paper, and ink or toner, you are using. You will get one level of quality when printing on your printer at home or in the office. You will get a different level of quality if you send your printing to a printing shop. There comes a point where increasing the ppi (pixels per inch) is not going to raise your print quality. This is because you have reached the limits of the other elements that affect the quality of your print. Printing and quality is all about balancing these elements with your budget and requirements. Another thing to consider is how your printing is going to be used. A large print viewed from a distance, such as on a hoarding or billboard, needs a lower resolution. A fine art print seen close up needs a higher resolution. A final consideration is the lower the image resolution, the less ink or toner you will use when printing. The industry standard is 300 ppi (pixels per inch). If you set your printing resolution to 300 ppi you can be sure your print will be sharp. This is a generous calculation. In reality, you can usually reduce to 240 ppi and still see no loss of quality when you print your picture. If you have no reason to reduce your image resolution, stick with 300 ppi to be safe. When printing on a local inkjet printer, at home or in the office, you can use a lower ppi. Professional printing shops often state the minimum ppi they require to be lower than 300 ppi. At 180 ppi you will probably notice a loss of quality, but the quality may still be acceptable to you. With less than 180 ppi, the print quality will be low. The fact that you can reduce the ppi to below 300 ppi is reassuring. Perhaps you want to print a photo in an A4 size, but at that size the resolution is 240 ppi. It is good to know you can probably still get a good quality print from it. You just need to remember that as the ppi becomes lower, the chance of a fuzzy print increases. To limit that risk, when quality is important, use the professional standard of 300 ppi. Use the arrows or type in the box for the X resolution to set it to 300 ppi. Press enter on your keyboard or click in the Y resolution box. The Y resolution will jump to match the X resolution. The width and height measurements will adjust to show the size you can print at 300 ppi. 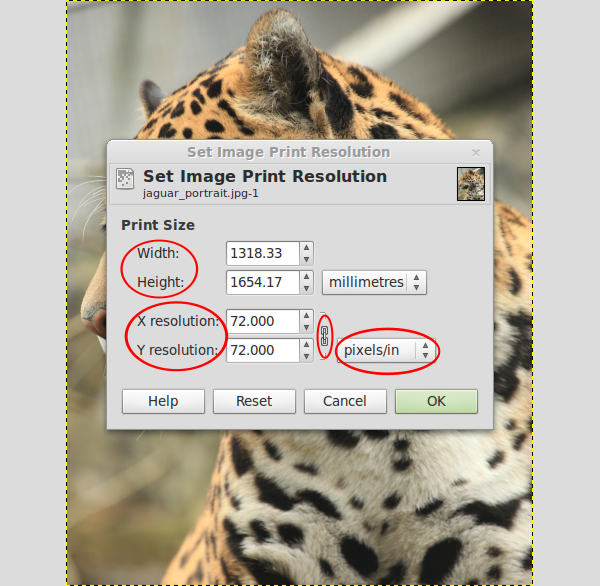 You can change the units of measurement your print size is shown in. Use the measurement option next to the width and height boxes. The figures will change to show the print size in your preferred unit of measurement (mm, cm, inches). If you know the size you want to print your picture, you can see if the resolution will be acceptable. Make sure the lock next to the X and Y resolutions is closed. Set either the width or height by using the arrow keys or typing in the box. The other dimension will change, keeping your picture in proportion, when you press enter or click in the other box. The X and Y resolutions will adjust to show the image resolution if you print at that size. Do remember that the width and height measurements, here, are your maximum print sizes at the set resolution. If you save your image, and your printer settings are set at 100%, your image will print at these sizes. But you can scale your image to make it print smaller. You can also lower the resolution. Reducing the width and height of a photo is never a problem. Increasing these dimensions can be. This is why it is recommended to save a master copy of your pictures at their full pixel dimensions. When you are happy with your choices, click OK in the “Set Image Print Resolution” box. If you need to change the width and height proportions of your picture, you will need to crop it. See our post Crop a photo with GIMP. 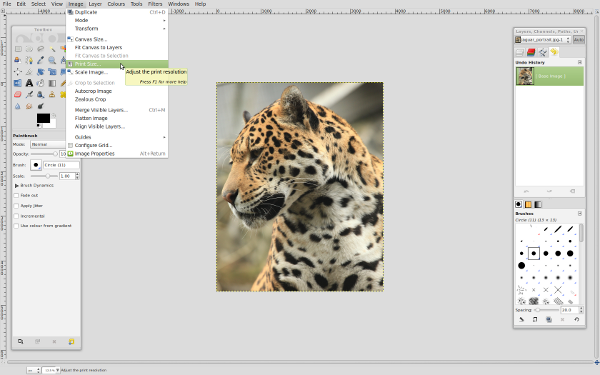 GIMP is the GNU Image Manipulation Program. It is similar to Photoshop. We offer graphic design services for print and the web. We also provide training and support. For all your design wizardry contact us here or visit JustOutsource.it our main website. How to crop a photo or image using GIMP. This is how to do a simple crop. It uses the Crop Tool. Click on the Crop Tool in the Toolbox. It looks like a scalpel. If it’s hard to find, hover over the icons to show the yellow tool tips. You can also select the Crop Tool by clicking SHIFT + C.
Hold the left mouse button and drag to select the area you want to keep. Highlight is selected by default. This makes the area you will keep bright and dulls the part of the picture that will be cropped. Click and drag on the sides to change the size of your selection. And/Or click and drag at the top and bottom. And/Or click and drag at the corners. Look at the mouse pointer as you hover over the drag lines. It will change to show what GIMP will do if you start dragging in that position. Look at Size in the Crop dialogue box as you drag the drag handles on the drag lines. The numbers change as you drag. You can change the measurement units that show the size. You can adjust the size precisely by typing in the size boxes or by using the arrows. Hover on the bright part of the picture. The mouse pointer will change to a diamond shape. Click and hold the left mouse button to move your selection over other areas of the picture. In the Crop dialogue box Position works in the same way as Size. Press Enter or Return on your keyboard. Save your cropped photo or image.